Angélique Kpasseloko Hinto Hounsinou Kandjo Manta Zogbin Kidjo, commonly known as Angélique Kidjo is a Beninoise singer-songwriter and activist, noted for her diverse musical influences and creative music videos. BBC African Service has included Angelique in its list of the continent's 50 most iconic figures. Time Magazine has called her "Africa's premier diva"
Her musical influences include the Afropop, Caribbean zouk, Congolese rumba, jazz, gospel, and Latin styles; as well as her childhood idols Bella Bellow, James Brown, Aretha Franklin, Jimi Hendrix, Miriam Makeba and Carlos Santana. She has recorded George Gershwin's "Summertime", Jimi Hendrix's "Voodoo Child" and The Rolling Stones' "Gimme Shelter", and has collaborated with Dave Matthews and the Dave Matthews Band, Kelly Price, Branford Marsalis, Robbie Nevil, Peter Gabriel, Bono, Carlos Santana, John Legend, Herbie Hancock and Cassandra Wilson. Kidjo's hits include the songs "Agolo", "We We", "Adouma", "Wombo Lombo", "Afirika", "Batonga", and her version of "Malaika". 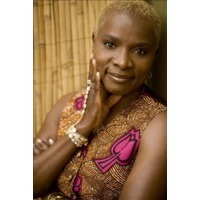 Kidjo is fluent in Fon, French, Yorùbá, and English and sings in all four languages; she also has her own personal language which includes words that serve as song titles such as "Batonga". Malaika is a song sung in Swahili language. She often utilizes Benin's traditional Zilin vocal technique and jazz vocalese.